Historically part of Lancashire, Abram anciently formed a township and chapelry in the parish of Wigan and hundred of West Derby. Abram appears in an entry of an ancient survey of Lancashire in 1212 under the name "Edburgham". The urbanisation and development of Abram largely coincided with the Industrial Revolution. Abram is at the centre of a coal district, and industrial scale coal mining was introduced to Abram around the middle of the 19th century with the opening of several collieries. In 1911, Abram was described as "distinctly unpicturesque ... trees are in the minority, and stunted and blackened with smoke", with "collieries, pit-banks, and railway lines" as well as "much pasture land". The Maypole Colliery Disaster in 1908 resulted in 75 deaths and profoundly changed the character of the village. Abram's coal mining industry declined in the mid-20th century, but the village has continued to grow due to its position between Leigh, Manchester, Warrington and Wigan. To the south of the village lies Abram Flashes, a 39.6 hectares (97.9 acres) area of shallow wetlands and a Site of Special Scientific Interest. Abram has historic associations with traditional morris dancing. The chimney of Maypole Colliery where there was a mining accident in 1908, profoundly affecting the village. The village name has been variously recorded as Edburgham in 1212 and Adburgham in 1246. In the 16th century it had evolved into Abraham, and by the 17th century the current name of Abram had become prevalent. It is suggested that Abram derives from Abraham, the surname of the medieval Lords of the Manor. The manor was probably part of the larger manor of Newton until it was granted to "Warine son of Godfrey" by Henry II who reigned 1154–1189. The family adopted the name of the settlement, and remained Lords of the Manor until the 17th century. The family was ruined by the English Civil War, in which they supported the Royalists. When the last in male line of the Abraham family died in the 17th century, possession of the manor passed through many hands, and the title of Lord of the Manor was still around at the start of the 20th century although held no manorial rights. Just after 17:00 on 18 August 1908 there was an explosion at the No 1, Cannell Mine of the Maypole Coal Pit. A total of 75 men and boys died in this mining accident. Because the explosion occurred deep underground, it was not until November 1909 that all the bodies were recovered. The inquest ruled that the explosion was caused by a combination of a buildup of coal dust and gas, and the use of explosives to bring down coal from the ceiling. The physical effects of the disaster on Abram are described as "profound"; the explosion made 44 women widows and killed the fathers of more than 120 children. At the time, Irish people were a large ethnic minority in Lancashire, making up between a quarter and a third of the populations of Leigh, St Helens, and Wigan. The Irish Catholic immigrants were seeking works on the Lancashire Coalfield, as demonstrated by the fact that 13 of the dead were Catholic migrants from Ireland. Many of the families affected by the disaster returned to Ireland shortly afterwards. The welcome sign to Abram features a logo drawing upon the history and culture of the village. Lying within the historic county boundaries of Lancashire since the early 12th century, Abram anciently constituted a manor, held by ruling families who paid tax to the King. Abram during the Middle Ages formed a township in the ecclesiastical parish of Wigan, and hundred of West Derby. Following the Poor Law Amendment Act 1834, Abram formed part of the Wigan Poor Law Union, an inter-parish unit established to provide social security. Abram's first local authority was a Local board of health established in 1880; Abram Local Board of Health was a regulatory body responsible for standards of hygiene and sanitation in the township. Following the Local Government Act 1894, the area of the Local Board became the Abram Urban District, a local government district within the administrative county of Lancashire. The urban district council had 12 members and was based out of Abram Urban District Council Offices. In 1957 there were exchanges of very small areas with Ashton in Makerfield and Golborne Urban Districts. Under the Local Government Act 1972, the Abram Urban District was abolished, and Abram has, since 1 April 1974, formed an unparished area of the Metropolitan Borough of Wigan, a local government district of the metropolitan county of Greater Manchester. Wigan Metropolitan Borough Council provides the local services. In terms of parliamentary representation, Abram is part of the Makerfield constituency; the Member of Parliament is Yvonne Fovargue, a Labour politician. At 53°30′29″N 2°35′17″W﻿ / ﻿53.50806°N 2.58806°W﻿ / 53.50806; -2.58806 (53.508°,-2.588°) and 173 miles (278 km) northwest of central London, Abram lies on mostly flat ground, with slightly undulating land at its southern end. The larger towns of Wigan and Leigh lie to the northwest and east respectively. For purposes of the Office for National Statistics, Abram forms part of the Wigan Urban Area. Suburban localities in and around Abram include Bamfurlong, Bickershaw, Bryn Gates and Platt Bridge. The land around Abram is generally flat and used for coal mining as well as arable farming. As a result, collieries were scattered across the landscape. The local geology consists of coal measures in the north and sandstone in the south; the soil is clayey and as a result, the area is susceptible to flooding. To the south of the village lies Abram Flashes a 39.6-hectare (97.9-acre) Site of Special Scientific Interest (SSSI). The site lies adjacent to the Leigh Branch Canal and is part of Wigan Flashes an area of wetland stretching for 10 kilometres (6.2 mi) between Wigan and Leigh. The flashes are shallow bodies of water which originate from flooding due to subsidence caused by shallow-mining. Abram flashes was designated an SSSI in 1990 due to its biological interest which includes various habitats such as open water, swamp, tall herb fen and wet marshy grassland. According to the Office for National Statistics, at the time of the United Kingdom Census 2001, Abram had a population of 9,855. The 2001 population density was 14,258 inhabitants per square mile (5,505/km2), with a 100 to 99.7 female-to-male ratio. Of those over 16 years old, 30.3% were single (never married) and 43.2% married. Abram's 4,037 households included 27.2% one-person, 40.0% married couples living together, 9.5% were co-habiting couples, and 12.5% single parents with their children. Of those aged 16–74, 42.2% had no academic qualifications. At the 2001 UK census, 84.7% of Abram's residents reported themselves as being Christian, 0.9% Muslim, 0.2% Buddhist and 0.1% Sikh. The census recorded 6.5% as having no religion, 0.1% had an alternative religion and 7.5% did not state their religion. St John's Church in Abram was constructed 1935–37, and is one of the works by Austin and Paley. The parish church of St John in Abram was constructed in 1935–1937, and is one of the works by Austin and Paley. There are two listed buildings in the village, both of which are Grade II; they are Brookside farmhouse, dating from the early-18th century, and a mid-18th century detached house on Warrington Road. Public transport in Abram is co-ordinated by Transport for Greater Manchester. A roads link Abram with other settlements, including the A573 road which bisects the town from north to south, and connects it to Wigan and Golborne. The M6 motorway runs to the southwest of the area, near Ashton in Makerfield, and is accessed via the A58 at junction 24 of the M6. Bickershaw and Abram railway station was a station on the now closed Wigan Central to Glazebrook line. It opened along with six other stations on 1 April 1884. It closed on 2 November 1964. There are frequent buses running through Abram with services to a variety of destinations in Greater Manchester, including services to Wigan, Leigh and Manchester. The Leeds and Liverpool Canal passes Abram to the southwest. Abram Bryn Gates Primary School is one of two primary schools in the village. It lies in the Bryn Gates area of Abram. The village has historic associations with traditional morris dancing and is home to Abram Morris Dancers. A plot of land by Park Lane in the southwest of Abram is known as the Morris Dancers' ground, and is popularly supposed to be held by the Abram Morris Dancers on condition that a morris dance be celebrated there once every 20 years. The Abram Circle is a dance native to Abram and is "renowned to morris dancers". The Abram Morris Dancers' logo appears on the boundary signs for the village. Abram has two primary schools: Abram Bryn Gates Primary School, and Abram Church of England Primary School. John Elisha Grimshaw was an Abram-born recipient of the Victoria Cross, the highest military decoration awarded for valour "in the face of the enemy" to members of the British and Commonwealth forces. Jenny Meadows is a British athlete. She attended Abram C of E Primary School on Simpkin Street and still lives in Abram today. Her main event is the 800 m, where she was European Indoor Champion in 2011. Mick Burke was a well-known mountaineer and rescuer who lived in Abram. He lost his life on Mount Everest in 1975 whilst working as a cameraman for the BBC. ^ a b c d e f g "Greater Manchester Gazetteer". Greater Manchester County Record Office. Places names - A. Archived from the original on 18 July 2011. Retrieved 17 June 2008.
. Retrieved 7 December 2008. ^ a b c d e f g h Brownbill & Farrer 1911, pp. 111–115. ^ Wigan Metropolitan Borough Council (2007). "About the Borough; Abram". wigan.gov.uk. Archived from the original on 21 July 2011. Retrieved 13 November 2007. ^ a b c d e Bean, Richard (20 August 2008). "Abram remembers pit disaster victims". wigantoday.net. Retrieved 16 December 2008. ^ a b CommuniGate. "Maypole Colliery Disaster 1908". communigate.co.uk. Archived from the original on 1 December 2008. Retrieved 16 December 2008. ^ HMSO. Local Government Act 1972. 1972 c.70. ^ Youngs, Guide to the Local Administrative Units of England, Volume 2. ^ Wigan Metropolitan Borough Council. "Article 1 - The Constitution". Wigan.gov.uk. Archived from the original on 13 November 2007. Retrieved on 1 December 2008. ^ "Makerfield parliamentary constituency". London: Guardian.co.uk. Archived from the original on 9 July 2008. Retrieved on 14 December 2008. ^ "Abram Flashes citation sheet" (PDF). English Nature. Archived (PDF) from the original on 13 October 2006. Retrieved 27 October 2006. ^ "Map of Abram Flashes". Nature on the Map. Archived from the original on 13 March 2007. Retrieved 27 October 2006.
. Retrieved 5 August 2008. ^ "Wigan Metropolitan Borough ethnic group". Statistics.gov.uk. Retrieved on 3 September 2008.
. Retrieved 31 August 2008. ^ "Abram Urban District". Vision of Britain. Archived from the original on 26 October 2012. Retrieved 14 December 2008. ^ "1981 Key Statistics for Urban Areas: The North Table 1". Office for National Statistics. 1981. ^ "Greater Manchester Urban Area 1991 Census". National Statistics. Archived from the original on 5 February 2009. Retrieved 24 July 2008.
. 22 July 2004. Retrieved 24 July 2008. ^ "Listed Buildings in Wigan Metropolitan Borough Council" (PDF). Wigan Metropolitan Borough Coulcil. Archived from the original (PDF) on 27 March 2009. Retrieved on 20 December 2008. ^ "Brookside farmhouse, Abram". Images of England. Retrieved on 20 December 2008. ^ "126 Warrington Road". Images of England. Retrieved on 20 December 2008. ^ a b c Greater Manchester Passenger Transport Executive (30 April 2008). "Network Maps: Wigan South" (PDF). gmpte.com. Archived from the original (PDF) on 18 November 2008. Retrieved 17 December 2008. ^ Wigan Metropolitan Borough Council. "Hindley Abram Township". wigan.gov.uk. Archived from the original on 5 September 2008. Retrieved 16 December 2008. ^ "Abram Bryn Gates Primary School". bryngates.wigan.sch.uk. Retrieved 16 December 2008. ^ "Welcome to Abram Church of England School". abram.wigan.sch.uk. Archived from the original on 29 March 2008. Retrieved 16 December 2008. ^ "Grave location for holders of the Victoria Cross in the county of : Middlesex". victoriacross.org.uk. Archived from the original on 20 August 2008. Retrieved 16 December 2008. Brownbill, John; Farrer, William (1911). A History of the County of Lancaster: Volume 5. Victoria County History. ISBN 978-0-7129-1055-2. Griffiths, Trevor (2001). The Lancashire Working Classes C.1880-1930. Oxford University Press. ISBN 978-0-19-924738-7. Pollard, Richard; Pevsner, Nikolaus (2006). The Buildings of England: Lancashire: Liverpool and the South-West. New Haven & London: Yale University Press. ISBN 0-300-10910-5. 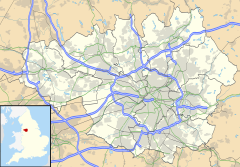 Wikimedia Commons has media related to Abram, Greater Manchester. www.abramchurch.co.uk, website of Abram St John the Evangelist Parish Church. www.abram-morris-dancers.org.uk, website of the Abram Morris Dancers, with a history of the Abram Morris Dancers Ground.